Why TPLF murdered Samuel Awoke? 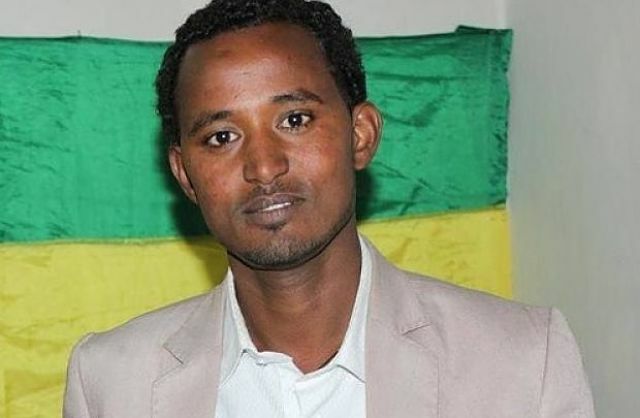 Samuel Awoke, a Semayawi Party candidate in the north-central Amhara Region at the May 24, 2015 vote, was killed by Tigrayan People Liberation Front (TPLF) security forces on June 15, 2015 in Debre Markos. The minority Ethno-communist TPLF regime is known to murder innocent people in day light and then appear at the funeral of their victims the next day acting as sympathizers. The cruel TPLF always kidnaps and kills innocent individuals and then pretend to look for evidence. The recent brutal murder of Samuel Awoke is absolute signs of what is coming. There will more death and there will more blood in that country as long as the minority Ethno-communist regime TPLF remains in power. Samuel Awoke was murdered for not being willing to withdrew his candidacy for election as a member of Semayawi (Blue) Party in Debre Markos. The cold blood murder of Samuel Awoke has been planned and executed by TPLF thugs. Prior to the murder, TPLF were threatening to kill Samuel several times. Samuel knew TPLF would kill him any time unless he withdrew his candidacy for election as a member of Blue party. Samuel even left notes on his Facebook to say that his life was under threat, and that he might either be killed or thrown into jail. Samuel Awoke was killed because he used to serve the farmers in Eastern Gojam zone for free as a lawyer. In October 2014, the newspaper, Negere Ethiopia has reported about Samuel awoke. The newspaper said that in the 2014 (2006 EC) performance evaluation of the Eastern Gojjam Zone bureau of Justice, the TPLF security members has condemned the Zone Justice bureau for not stopping Samuel Awoke from being a lawyer for the defenseless farmers in Easter Gojam zone who don’t support the TPLF policy on land. During that time TPLF security members has tried to force him leave the region and the country however Samuel has got the guts to remain in his country and keep serving his people on his profession. From that time on, Samuel Awoke has been beaten, harassed and terrorized by TPLF many Times, before he was being murdered in June 15. In the recent May 24, 2015 national election of the country, the TPLF lead Ethiopian People’s Revolutionary Democratic Front (EPRDF) ruling party swept all the 547 parliamentary seats. TPLF lead EPRDF ruling party won 100% by quashing dissent, jailing bloggers and journalists for their views and rigging elections. Wining the parliamentary seats 100% was not enough for the TPLF megalomaniacs; the cruel TPLF has to kill bright Ethiopian children like Samuel Awoke to control everything in the country i.e., militarily, politically and economically. However one thing clear, TPLF killers will be made to pay for all these bloods and lives one day.